Kongsberg Digital (KDI) will deliver to GasLog a comprehensive liquefied natural gas (LNG) simulator package designed to enable new levels of safety and operational training for the owner/operator's professional crews. GasLog operates 27 LNG vessels through its subsidiary, GasLog LNG Services and has seven ships currently on order. The KDI contract represents a commitment and investment on GasLog's part to provide a high-level training environment for their crews, solely focused on LNG operation. 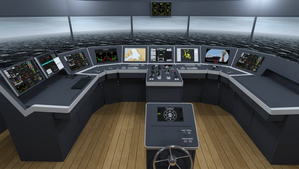 The scope of supply is based on an integrated, turnkey training solution featuring a K-Sim Navigation DNV Class A ship's bridge simulator and a K-Sim Engine Desktop simulator including the Steam Plant Dual Fuel LNG Carrier and the Diesel Electric Duel Fuel DE21 LNG models. The engine room models will be interfaced to a corresponding K-Sim Cargo LNG Liquefied Natural Gas Carrier-M cargo handling simulator. The simulators will be installed in GasLog's Technical Management HQ in Piraeus, Greece, with an entire floor specifically allocated for simulator training activities. GasLog's investment in the K-Sim package emphasizes the central importance of simulator training within the Greek LNG arena. In addition to GasLog, KDI provides K-Sim training solutions for Minerva Marine, Maran Gas Maritime, TMS Cardiff Gas and Tsakos Energy Navigation, meaning that it services more than half of the nine companies which constitute the Greek LNG carrier fleet. "Greece is poised to become the largest and most significant shipping nation in the global LNG sector," said Tone-Merete Hansen, Sr. Vice President in Maritime Simulation, Kongsberg Digital, "and KDI is proud to be such an integral associate in support of this drive. Promoting and perpetrating the smart transportation and usage of a clean, economically efficient fuel ties in very closely with our corporate desire to enable safer, greener and more streamlined working practices." "Straight from the outset, KDI's integrated simulator solution will allow our trainee crews to reinforce and build upon our core values of teamwork, quality of service, integrity and customer focus," added Archontia Leni, the Competency Assurance Manager at GasLog. "Above all, as our company credo indicates, safety means the world to us - and KDI's innovative simulator training package will help us to establish and support a culture of crew protection and environmental awareness that resonates throughout our entire organization."